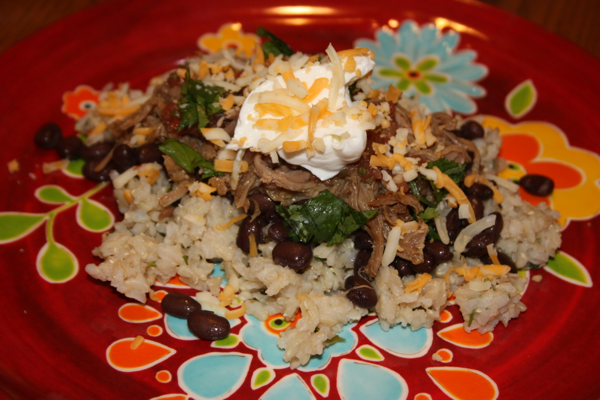 Crock pot Carnitas served over top cilantro brown rice with black beans. Our family is a big fan of those huge burritos you can buy and the now trendy burritos restaurants that are popping up everywhere. I usually could force myself to eat an entire burrito, but have recently been resisting the temptation and cutting it in half before starting to eat and then taking half home for another meal. It is quite tempting to eat the entire thing, but I know I don’t need it. I’ve realized that making some of our favorite foods that we eat out at home allows me to better control portion size. 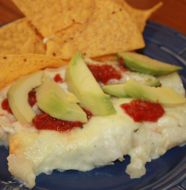 I was so glad when my friend Karla shared this recipe. Now I have a new favorite carnitas recipe, and the flavors are superb. We have used the meat for burrito bowls and burritos and I have some more leftover that promise to be delicious in some enchiladas or tostadas. (Don’t you love cooking a big batch of something that can be used in multiple dishes and then makes for easy meals throughout the week? Heat a large skillet over medium-high heat. 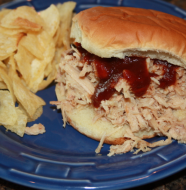 Trim the pork of any excess fat. Season with salt and pepper. Brown the pork on all sides for about 10 minutes total. Remove from heat and allow to cool slightly. Once the pork is able to be handled, season it generously with cumin, adobo, and garlic powder, pressing the seasoning into the meat. Once the roast is well coated add the roast to the crock pot. Combine the chicken broth, chipotle peppers and garlic together in a 2-cup measuring cup. Pour the mixture into the crock pot. Add the bay leaves and cover with lid. Cook in the crock pot for 6 hours on high or 8 hours on low. Once the meat is tender shred the pork and combine back into the cooking liquid remembering to remove the bay leaves before serving. One Comment on "Crock Pot Carnitas"
So glad you enjoyed this!!! 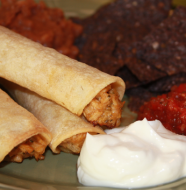 It became a fav at our house on the first night we tried it!